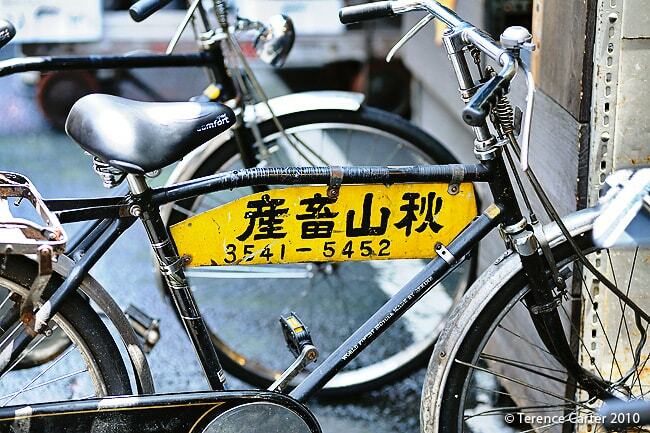 Tsukiji Outer Market is a must after visiting the Tsukiji Fish Market proper. 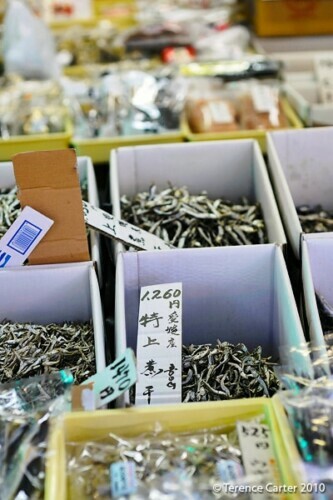 The Outer Market shops specialise in everything from Japanese handmade knives and kitchen supplies to cooking ingredients and products from towns and regions across Japan. 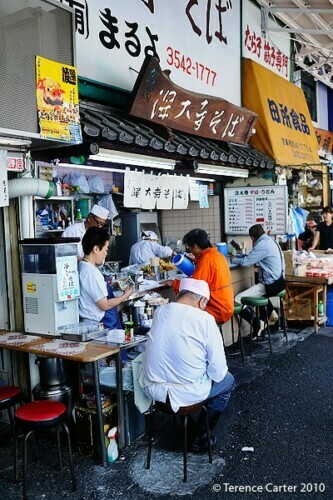 Tsukiji Outer Market is a must for food lovers and cooks, both professional chefs and home cooks alike, after visiting the Tsukiji Fish Market proper. 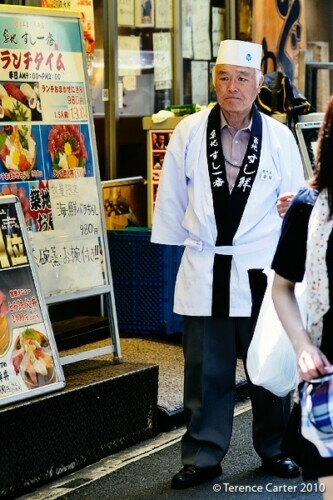 After exploring Tsukiji Fish Market*, where we tasted the most sublime tuna of our lives, our guide for the day, Tokyo food and sake expert, Etsuko Nakamura, takes us across the road to explore the Outer Market. “For me, this is just as interesting, if not more interesting in some ways, than visiting the fish market, and definitely more interesting than the tuna auction!” Etsuko tells us as she leads us on a tour of what turns out to be a paradise for food lovers and cooks, professional chefs and home cooks alike. 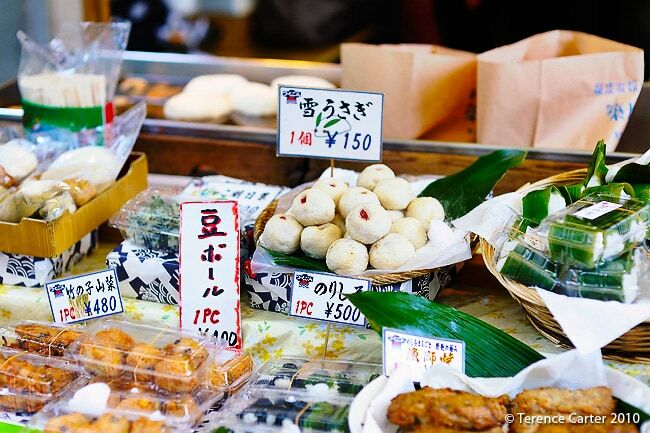 At Tsukiji Outer Market specialist shops sell everything from Japanese handmade knives and kitchen supplies to Japanese ingredients and products from across Japan and each shop specialises in a particular product or type of produce. 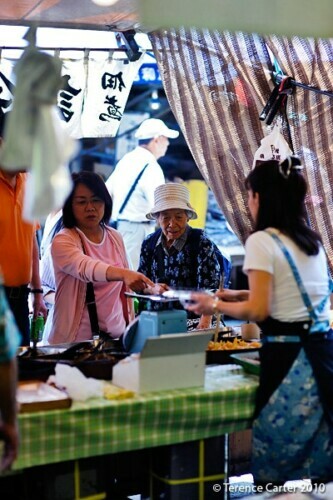 For example, four or five shops only sell Tamago-Yaki or Japanese omelette, in different versions, from sweet to salty, plain, with seaweed or vegetables. 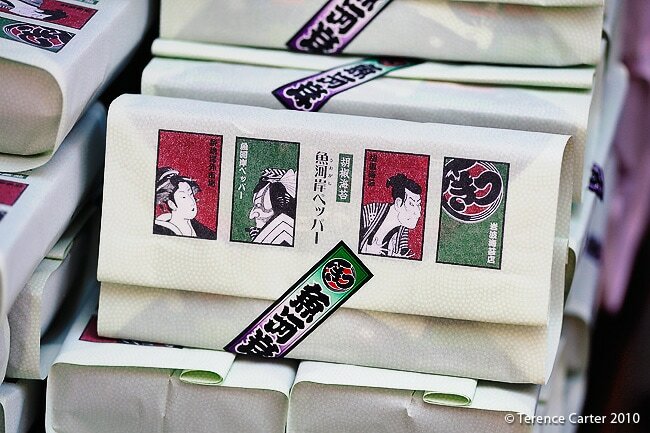 There are shops that are tofu specialists selling every conceivable form of tofu — they even sell tofu ice-cream! 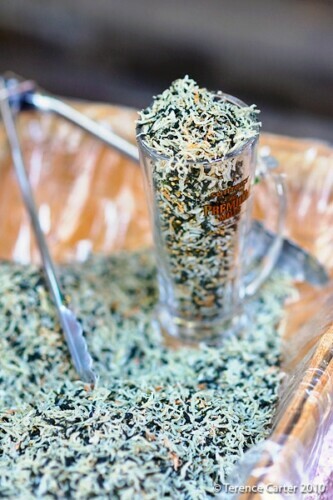 Countless shops sell nori (seaweed) and nothing else — the seaweed with wasabi that they were giving away samples of on the day we visited was pretty wild! Etsuko takes us to a shop specialising in unagi or dried fish in all its many shapes and forms, which she reveals is seasonal. July is the month to buy it at Tsukiji Outer Market and there’s a particular day when there is so much unagi that the smell is enough to get people down here. “It’s so popular in Japan because it’s healthy with loads of vitamin B and is a great energy source,” Etsuko says. 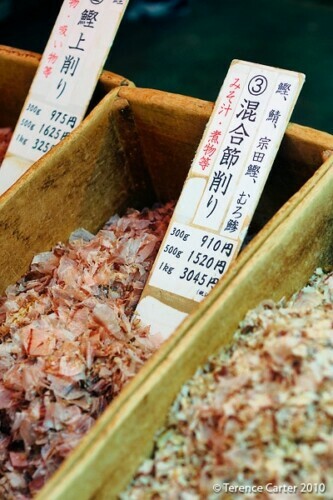 Many of the shops at Tsukiji Outer Market focus on just one or two specialty products from a particular region or town. One shop stocks only the finest quality beef from Yoshizawa, another trades in seafood and the colossal summer rock oysters from Ivakaki that we’ve been enjoying while we’ve been in Tokyo. They’re so tempting some visitors bought them on the spot and downed them at the stand! Other shops at Tsukiji Outer Market specialise in bonito flakes (katsuobushi), used to make dashi — the stock that forms the base of many soups and sauces in Japanese cooking. 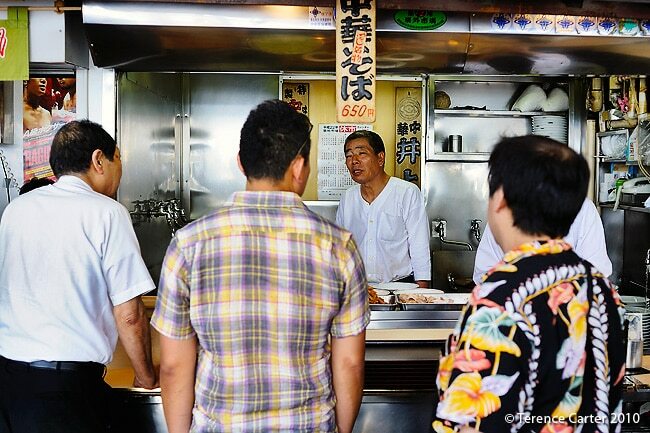 The customers were all regulars getting their supplies of katsuobushi to make stock for their restaurants. At a shop specialising in products from the region of Kanogazawa on the coast, Etsuko points out some tarako or spiced cod roe from Kyusho, which she tells us you can eat by itself with rice or can cook and serve with noodles or even pasta. Just when we see the connection between tarako and the Italian bottarga which we loved cooking with in Sardinia, we spot some bottarga displayed on a stand beside the tarako. “Here it’s called karasumi, and we slice it thinly and serve it with sake — it’s the best pairing possible!” Etsuko says, her face lighting up. Sake is her specialty. One of the final shops that Etsuko takes us into is one that initially appears to specialise in frozen food, but which Etsuko reveals is the place at Tsukiji Outer Market for Tokyo’s fine dining chefs to come to buy the pre-prepared bits and pieces, ingredients and garnishes that are used to create the intricate dishes that make up the multi-course meals that comprise a kaiseki feast. 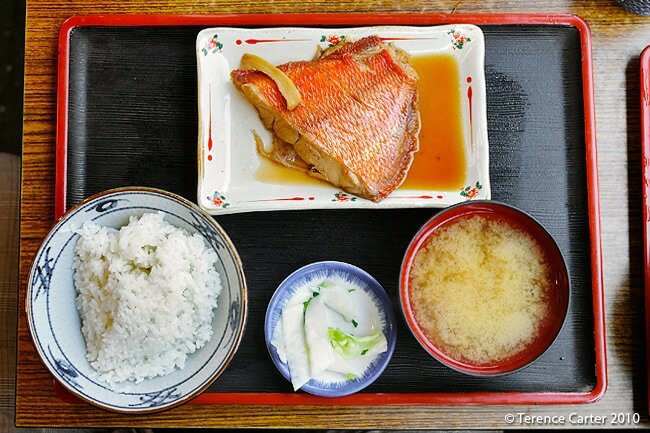 “Kaseki was the meal that originally accompanied tea ceremony,” Etsuko reveals. 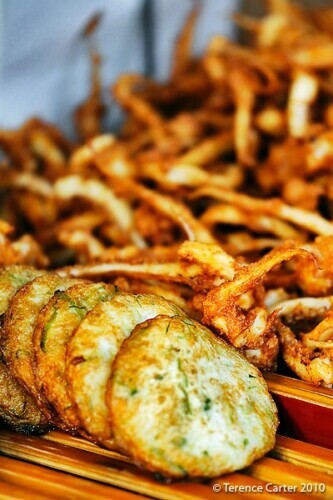 “So the dishes were simple, and pure, but elegant. Now the dishes are so much more elaborate.” These are the places the Michelin guide loves. 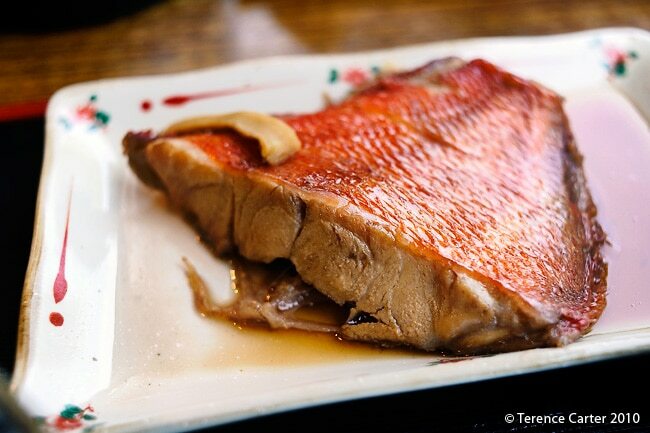 We ask Etsuko for recommendations for spots to eat at Tsukiji Outer Market because we’ve found the sheer number of places overwhelming and it’s hard to know which guidebooks to trust. Etsuko’s response is similar when we ask her for tips for the best sushi spots at Tsukiji Outer Market after we see tourists crammed into a sushi joint that is in all the guidebooks. She screws up her nose at the particular spot we mention, telling us it’s no better than any other sushi joint. 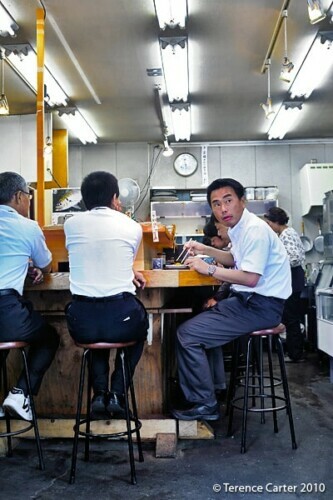 Etsuko also reveals that the whole sushi breakfast thing is something only tourists do. 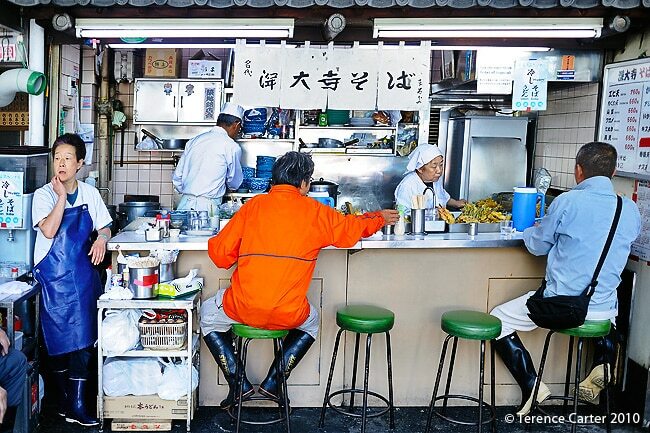 You’ll see far more rubber boots at the local noodle joints and sandwich shops at the market than in the sushi restaurants — for a variety of reasons. As we discovered, the main difference at the top end is the reputation of the chef and the chef’s presentation of the sushi. 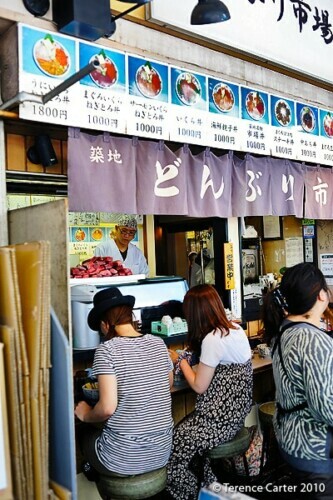 As if to prove her own point, when we ask Etsuko where we can take her for lunch, she leads us out of the Tsukiji Outer Market to the perimetre where there are a row of simple no-frills eateries, and takes us to a simple teishoku (set menu) place. It’s a sultry day, it’s not yet noon and the outside tables, even those in the sunshine, are packed with local workers, as are the tables inside. We bag a table in the shade as soon as one is free, and while we’re downing icy cold beers, long lines begin to form out front. Each day there are different specials — today it’s sea urchin (which Lara and Etsuko opt for) and a local fish (which I choose) — and each set menu comes with vegetables, sauces, pickles, miso and rice for the equivalent of US$9 or UK£6 per person, along with some of the cheapest beers we’ve bought in Tokyo. 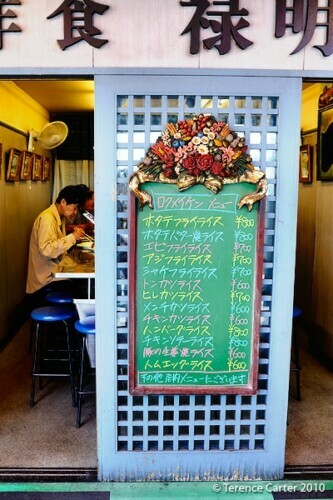 There are no English menus, staff don’t speak English (but it would be easy enough to point if Etsuko wasn’t with us), and thankfully, there aren’t any tourists lining up. 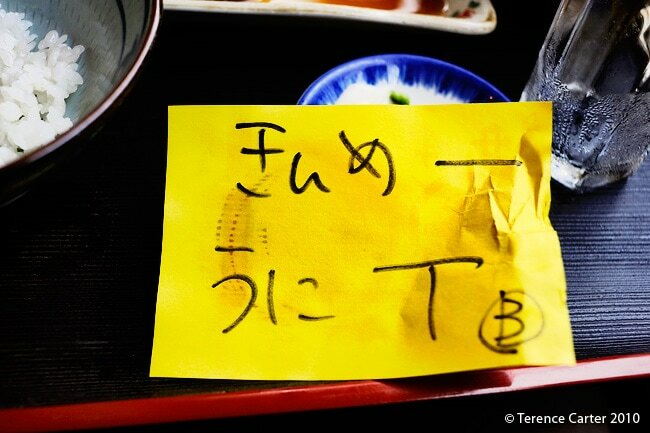 *Note: Tsukiji Fish Market has now closed. Click through for details on the Tsukiji Fish Market closure and opening of the new Toyosu Fish Market. 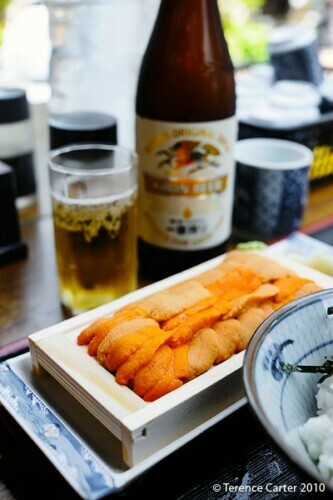 If you’d like to hire Etsuko for a wander around Tsukiji fish markets or a sake related tour contact her via her blog Tokyofoodcast or her Sake Tours site. love your blog and photos….just fabulous..great concept and flawless excecution..very diffrent from all the other blogs out there..
question for terence, there’s a remarkable “pop” and clarity in so many of your photos. I realize you may be using some off camera flash or high end lenses on some of them. Or is it a special “sauce” during post processing.. Clarity and pop is *exactly* what I’m after, so thank you – you’ve made my day! Off-camera flash? No, unless it’s a portrait like the one at midnight for Tokyo. High end lenses? Absolutely. Shallow depth of field helps separate the subject from the background and gives you much sharper pictures. I also mainly use prime lenses. Post processing is quick and dirty. I do try to make the set of photos have a similar ‘tone’ for sure, but no real special herbs or spices. I do picture the set as a ‘package’ and try to select photos that will work together as much as possible as well. 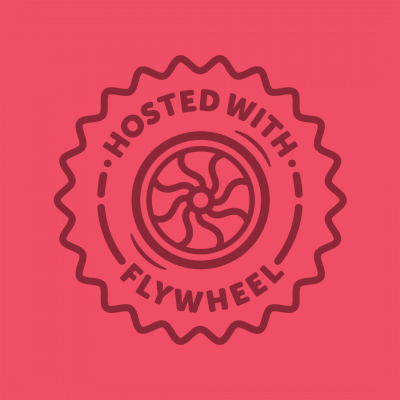 I am also trying to give each destination a particular feel as well, so I hope that comes through!